Best experience in Japan so far! If you intend on renting a kimono I STRONGLY suggest you wear the kimono for this activity. we did one hour which was not enough for me but just right for my parents and husband. It wasnt enough for me because it was basically a photoshoot with tons of money shots. Im always looking for more money shots with the Fam! They take you on private lanes through the bamboo forest and it was such a relief to not be fighting the immense waves of tourists on the Main Street. we were essentially given two choices for 1 hour: spend all your time in the bamboo forest or go visit a shrine and only do part of the bamboo forest. Like I mentioned previously, its a photo shoot with a rickshaw ride so I strongly suggest including one temple visit. I also suggest bringing some type of fancy camera or wide angle lens attachment for your cell phone. I had a wide angle attachment and it really made for fantastic images. A visit to Arishayama, just a short day trip from Kyoto, is the true definition of dreamy and surreal. 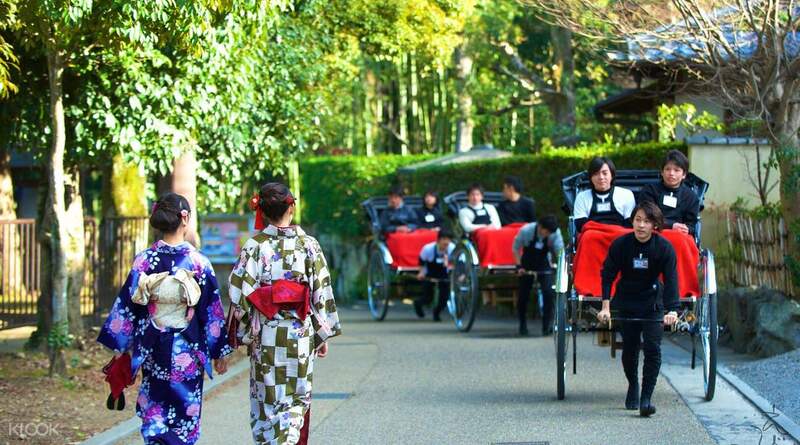 Spend quality time with nature as you visit lush green gardens together with your guide or enjoy gliding through parts of the iconic Arashiyama bamboo forest leading to a popular shrine in its midst. Let the 'Zen' spirit bring your body to perfect harmony as you gaze upon the splendid temple architecture and tranquil forest, feeling like true nobility as you enjoy the services of an enthusiastic tour guide from your rickshaw seat. Meet up point: North Side of Togetsukyo Bridge or South exit of JR Saga-Arashiyama Station. Everything was perfect when it came to this rickshaw tour. We only signed up for the 30-minute tour and even before we got to Japan, the customer service agent Larissa already emailed us to enquire where we would like to start / end the tour from / at, and if we needed any assistance with anything else. She was so accommodating, understanding & helpful that it made me wonder if the actual tour itself was gonna live up to that standard. When we arrived at JR Arashiyama station, we saw 2 rickshaw guys holding up a sign with our name on it, excitedly waving at us. They spoke awesome English, had the bubbliest personality & briefed us about the tour before we got started. Amazing views of the bamboo forest and also its surrounding areas, but what was even better was the information they shared with us on the places we passed by, and the amount of laugher we shared. Our 4 year-old boy enjoyed it so much, he even got the rickshaw guide to teach him how to say ‘dinosaur’ in Japanese. 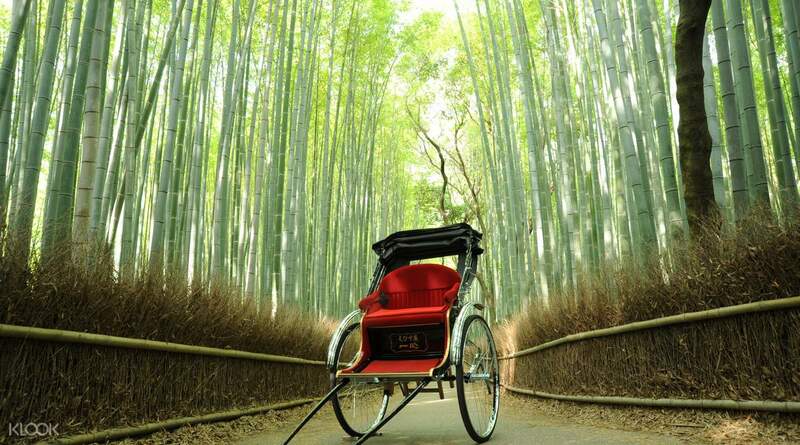 I’d definitely recommend this tour to anyone visiting Arashiyama for the first time ! Priceless experience. Everything was perfect when it came to this rickshaw tour. We only signed up for the 30-minute tour and even before we got to Japan, the customer service agent Larissa already emailed us to enquire where we would like to start / end the tour from / at, and if we needed any assistance with anything else. She was so accommodating, understanding & helpful that it made me wonder if the actual tour itself was gonna live up to that standard. When we arrived at JR Arashiyama station, we saw 2 rickshaw guys holding up a sign with our name on it, excitedly waving at us. They spoke awesome English, had the bubbliest personality & briefed us about the tour before we got started. 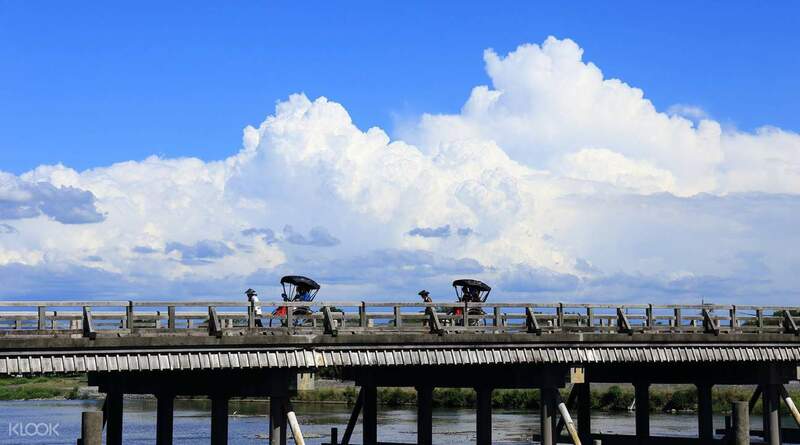 Amazing views of the bamboo forest and also its surrounding areas, but what was even better was the information they shared with us on the places we passed by, and the amount of laugher we shared. Our 4 year-old boy enjoyed it so much, he even got the rickshaw guide to teach him how to say ‘dinosaur’ in Japanese. 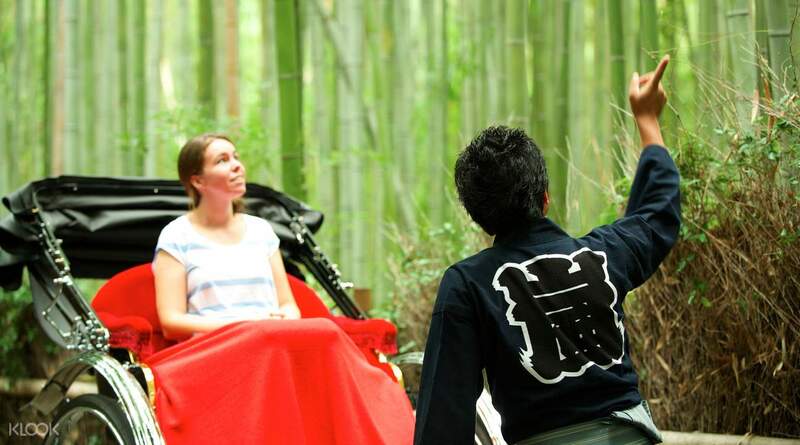 I’d definitely recommend this tour to anyone visiting Arashiyama for the first time ! Priceless experience. 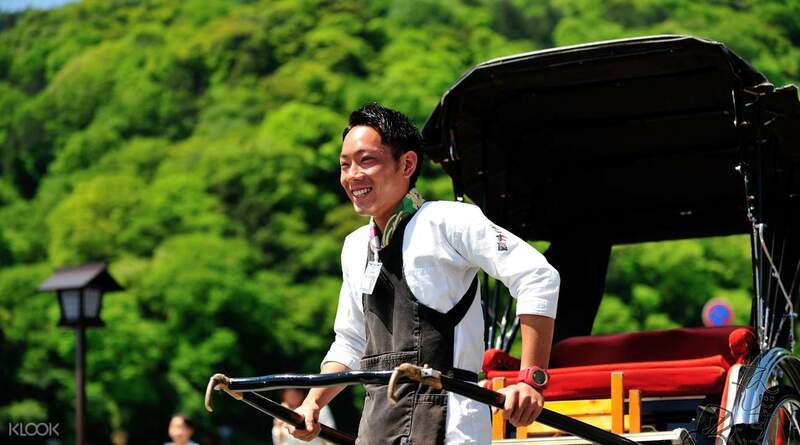 it was an awesome experience because we also got a bit of history from our very nice and friendly rickshaw guide, Yoshi! he was very kind and we enjoyed our ride. the bamboo path really looks nice and we saw a lot of temples too. i recommend this tour for a nice time in kyoto. it was an awesome experience because we also got a bit of history from our very nice and friendly rickshaw guide, Yoshi! he was very kind and we enjoyed our ride. the bamboo path really looks nice and we saw a lot of temples too. i recommend this tour for a nice time in kyoto. The riskshaw ride was so worth it! I had my parents with me so this was perfect for them. We were in 2 rickshaws. The drivers were conversant in English, cheerful, humorous, and they gave narrations as we move along the route (less crowded) they had suggested. And they took such awesome pictures which we would have never done so on our own! Very comfortable and we were well taken care of during the one hour ride. The bamboo forest was the highlight .... simply breathtaking. I would highly recommend this experience. You can get a good overview of this place after which you can explore on your own. Many lovely memories here. The riskshaw ride was so worth it! I had my parents with me so this was perfect for them. We were in 2 rickshaws. The drivers were conversant in English, cheerful, humorous, and they gave narrations as we move along the route (less crowded) they had suggested. And they took such awesome pictures which we would have never done so on our own! Very comfortable and we were well taken care of during the one hour ride. The bamboo forest was the highlight .... simply breathtaking. I would highly recommend this experience. You can get a good overview of this place after which you can explore on your own. Many lovely memories here. We booked the 30mins tours. Right from the start, the process is very clearly explained and seamless. Once the voucher is booked, I’ve received confirmation email together with very clear instruction on where to go to on the day. The customer service liaison was very friendly and helpful. Our tour guide was really professional and knows the area well. He speaks great English and a fantastic photographer too. We should have gone for the 60mins tour instead. Highly recommended for anyone who is considering this. We booked the 30mins tours. Right from the start, the process is very clearly explained and seamless. Once the voucher is booked, I’ve received confirmation email together with very clear instruction on where to go to on the day. The customer service liaison was very friendly and helpful. Our tour guide was really professional and knows the area well. He speaks great English and a fantastic photographer too. We should have gone for the 60mins tour instead. Highly recommended for anyone who is considering this. My Husband and i took 1 hr package with Mr山田. Super friendly guy who can speak english and chinese too! he too have superb photography skills and explains the area well. this tour is definitely a must go ! My Husband and i took 1 hr package with Mr山田. Super friendly guy who can speak english and chinese too! he too have superb photography skills and explains the area well. this tour is definitely a must go ! Great experienced and hassle free service, Ebisuya is very accommodating as well, as they replied and gives clear direction on meeting point, accommodating me being late and very friendly...all the staff are. Great 30 minutes touring the area, well informed rickshaw driver and he takes good picture as well including editing [ὠa]. Definitely recommended. Great experienced and hassle free service, Ebisuya is very accommodating as well, as they replied and gives clear direction on meeting point, accommodating me being late and very friendly...all the staff are. Great 30 minutes touring the area, well informed rickshaw driver and he takes good picture as well including editing 😊. Definitely recommended. Watanabe San was great. He seemed to be pulling the rickshaw effortlessly. He takes wonderful and artistic pics that made our tour complete :) He is able to speak English, Japanese and Mandarin,which is really good for different nationalities. Watanabe San was great. He seemed to be pulling the rickshaw effortlessly. He takes wonderful and artistic pics that made our tour complete :) He is able to speak English, Japanese and Mandarin,which is really good for different nationalities. Awesome experience. Highly recommended. Ichi is very entertaining and knowledgeable at the same time. Also knows the best places for photo taking. I wished I had taken the 2hr tour! Awesome experience. Highly recommended. Ichi is very entertaining and knowledgeable at the same time. Also knows the best places for photo taking. I wished I had taken the 2hr tour!